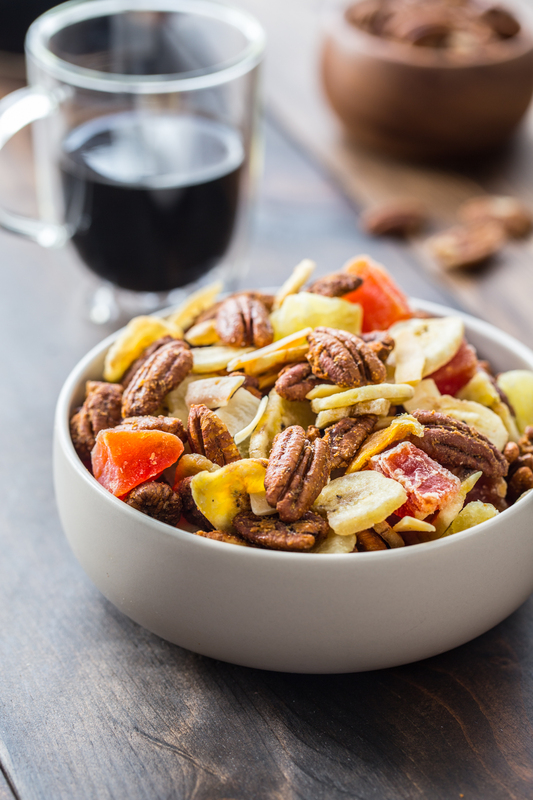 Having a few Pecan Snack Mixes in your pantry can be a great way to eat a well rounded snack on a busy day or to take with you when you’re on the go. Pecans pair perfectly with both sweet and savory ingredients and these three versions are my favorites! This post is sponsored on behalf of the American Pecan Council. All opinions are, as always, my own. The end of summer break is upon us. My kiddos start back to school next week and it’s a bittersweet feeling. On one hand, I love the structure and schedule that comes with the school year, but it will take me a few weeks to get used to them being back to school. I’ll miss their company, their funny stories, their crazy games, and their sweet morning hugs when they come downstairs to check on me in my studio before getting themselves some breakfast. They pretty much spent the entire summer playing on the swings, riding their bikes with their cousins, or swimming at my parent’s house. It was relaxing the way summer should be, but it just went way too fast. While the kids are home in the summer, I try to work as sparingly as possible during the day when my husband was at work and the kids were home, but it meant a lot of late nights working on my computer and weekends full of recipe testing and photo shoots. Now that A and C are going back to school, I’ll need to get myself back into my normal work schedule of working during the school day which is great in freeing up my nights and weekends. I will also be back to making sure I take the time to eat regularly throughout the day. That might seem like a weird thing to say, but when I’m alone at home and working, often times the day flies by and I realize I never sat down to eat a proper meal or even worse, just snacked on junk here and there. 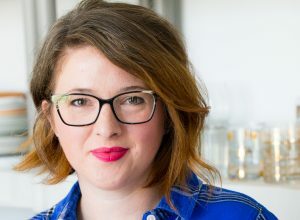 When the kids are home, I’m more aware of meal times and will make myself a lunch when they eat or we will all have a snack together – that type of thing. So, in order to get myself off on the right foot this school year, I’ve been working on having some great go-to snacks that are full of wholesome ingredients that will give me some energy during the day. I’m all about pecans! Not only are they heart healthy with power-packed protein, but they are a complex whole food with multiple health-promoting nutrients. Their rich, buttery texture and naturally sweet taste pair perfectly with both sweet and savory ingredients. Do you remember my Spiced Pecan Grilled Peach Salad? That’s been a lunch time favorite for the last month in my house. Did you know? Pecans are best stored in the refrigerator in a sealed plastic bag and will last up to 2 years in the freezer. I like to snack on them fresh from the freezer as they don’t freeze to a hard consistency, they are just pleasantly chilled. 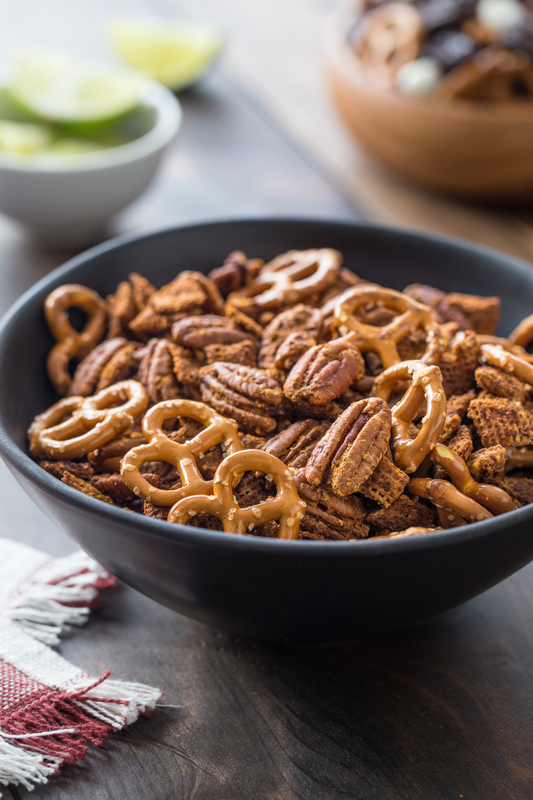 These new pecan snack mixes run the range from salty to sweet. Having these on hand is sure to help me out in eating smarter during the work day. 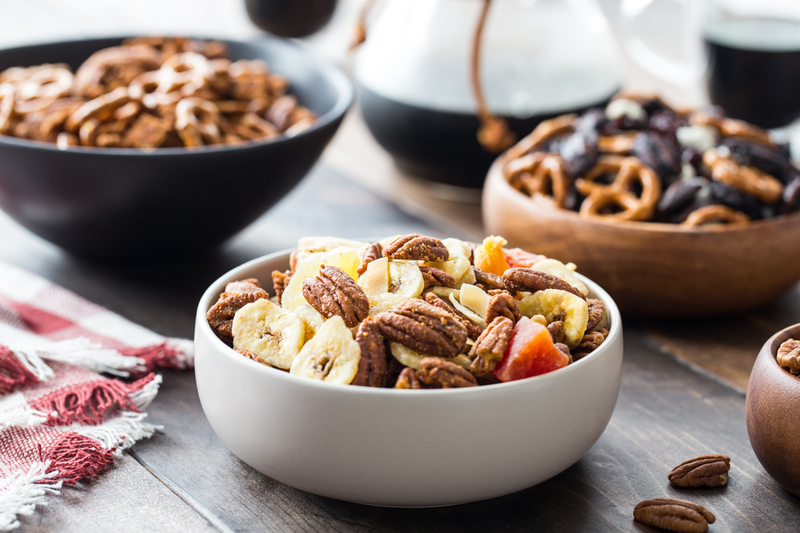 This is a simple snack mix inspired by my favorite childhood snack mix. The pecans and wheat cereal squares are seasoned up with some chili powder, lime juice, and a few other spices. 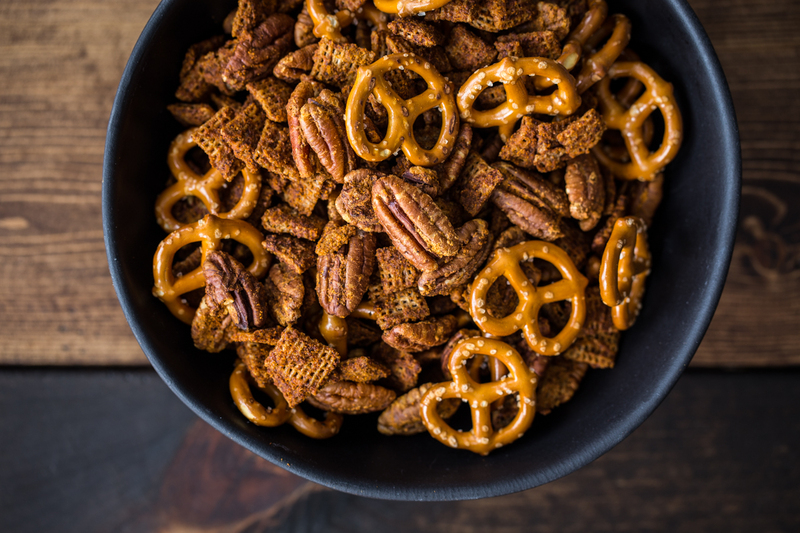 The spice mixture gets backed into the pecans and cereal and then tossed with a few pretzels resulting in a great salty snack with a kick! 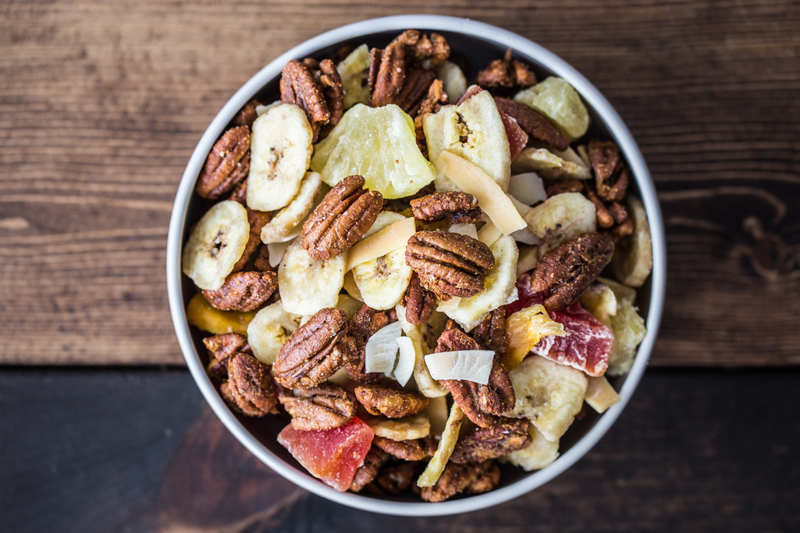 This snack mix has a great balance between sweet and savory. The ginger gives a nice spice, but pairs well with the touch of honey. The pecans are so buttery in their texture that the honey ginger flavors sweet as if they were made for these pecans! I added a few of my favorite dried fruit: banana chips, coconut, and some tropical mixed fruit. You can add or omit whatever your favorites are. This wouldn’t be an Emily recipe if I didn’t throw some chocolate into the mix. I toyed with this version a few different times, but ended up going with this recipe that takes the pecan halves and glazes them with lightly sweetened dark chocolate. 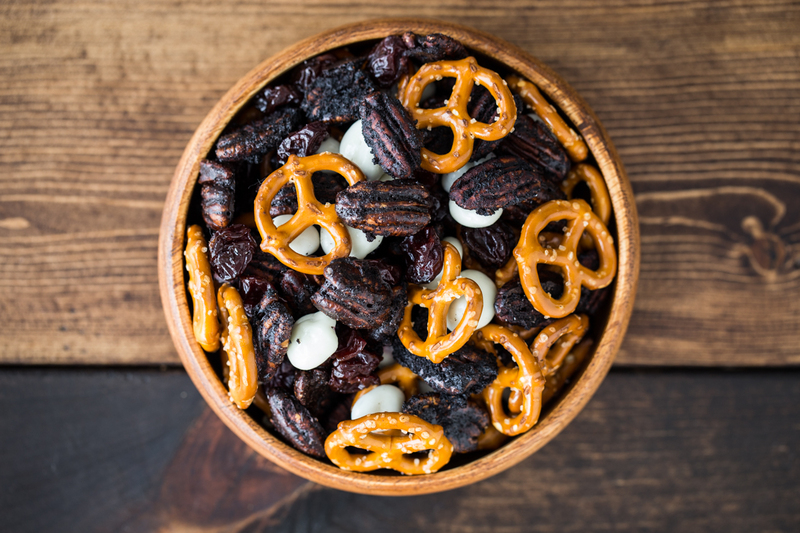 The chocolate glazed pecans get tossed with dried tart cherries, yogurt covered raisins, and a few pretzels to add some saltiness. I’m a huge fan of a sweet/savory combo so this one my just be my favorite! 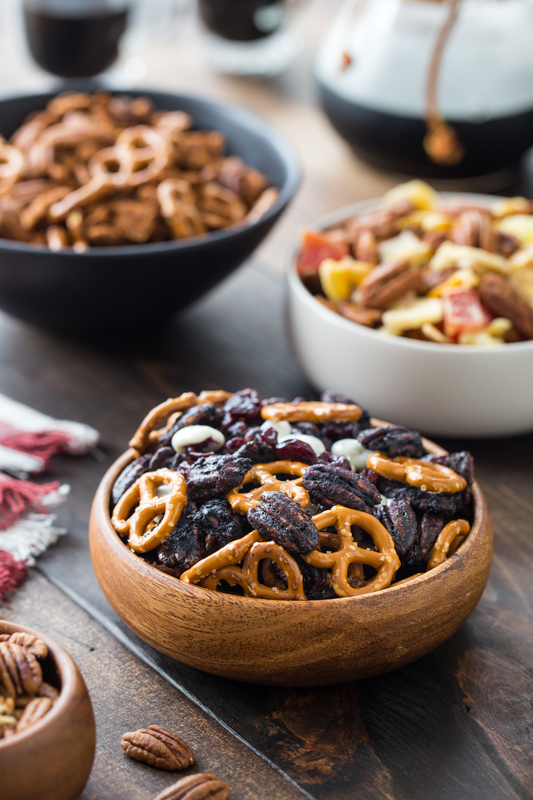 Have you ever tried pecan snack mixes? What are your favorite flavor combinations? Whisk together egg white, lime juice, olive oil, chili powder, cumin, garlic powder, salt and salt until well blended. Fold in pecan halves and cereal until well coated. Spread mixture onto parchment lined baking sheet. Bake at 275°F for about 40-45 minutes or until mixture is toasted. Stir pecan mixture several times during baking. Allow pecans to cool completely and transfer to a bowl. Mix in pretzels and serve. Whisk together egg white, honey, ground ginger, and salt until well blended. Fold in pecan halves until well coated. Spread pecans onto parchment lined baking sheet. Bake at 275°F for about 40-45 minutes or until pecans are nicely toasted. Stir pecans several times during baking. Allow pecans to cool completely and transfer to a bowl. Mix in coconut, banana chips, and dried pineapple. Whisk together egg white, brown sugar, cocoa powder, vanilla extract, and salt until well blended. Add about 1 Tablespoon water to thin mixture slightly. Fold in pecan halves until well coated. Spread mixture onto parchment lined baking sheet. Bake at 325°F for about 15-20 minutes or until mixture well set. Stir pecan mixture several times during baking. Allow pecans to cool completely and transfer to a bowl. 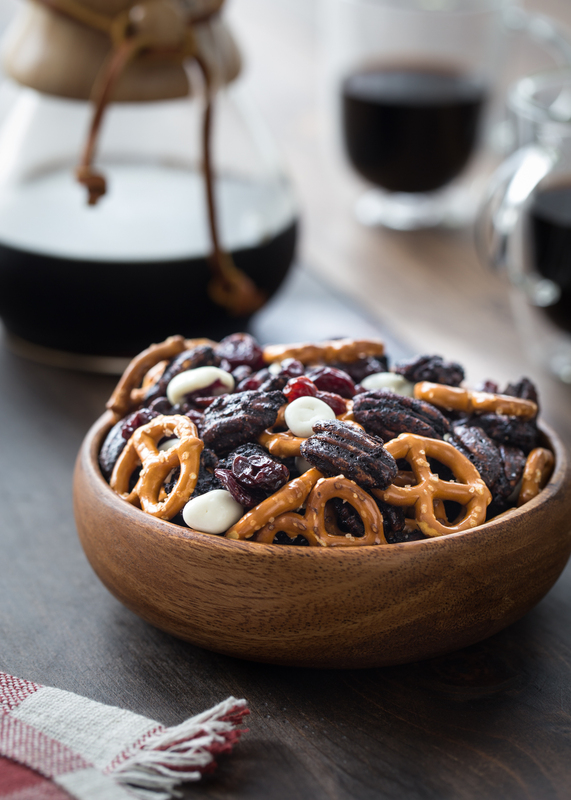 Mix in dried cherries, pretzels, and yogurt covered raisins.